The Maitland News was a local newspaper originally published by the Maitland Realty Company (and later by the Maitland News Company) which began circulation in April 1926. 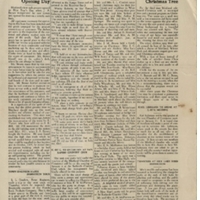 This edition features articles on topics such as the opening of a new cash grocery, Christmas events, an engineering inspection, the Ku Klux Klan providing Christmas gifts, a Chamber of Commerce meeting, a cabinet shop opened by the Maitland Lumber Company, the fire department's fundraising efforts, a record yield of grapefruit, the housing arrangements of local residents, and a local events calendar. Also featured is a legal notice and several advertisements for local businesses. Original 4-page newspaper edition: The Maitland News, Vol. 02, No. 1, January 5, 1927: Newspaper Collection, accession number 2014.002.020V, room 2, case 2, shelf 10, box GV, Maitland Historical Museum, Art & History Museums - Maitland, Maitland, Florida. Digital reproduction of original 4-page newspaper edition: The Maitland News, Vol. 02, No. 1, January 5, 1927. “The Maitland News, Vol. 02, No. 1, January 5, 1927.” RICHES of Central Florida accessed April 19, 2019, https://richesmi.cah.ucf.edu/omeka/items/show/6465.